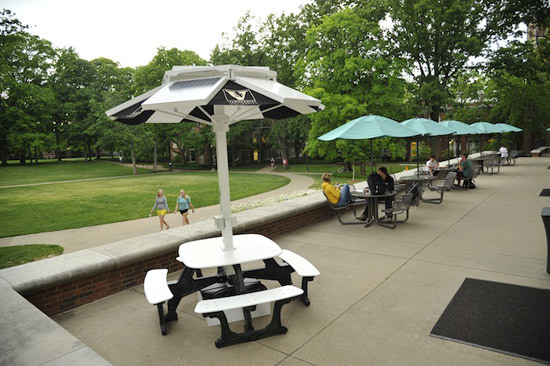 To purchase a Solar Dok table, please contact the manufacturer, Enerfusion, Inc.
Members of the Vanderbilt community can now enjoy the outdoors and charge their personal electronics at the same time thanks to four solar-powered charging stations that have been installed on campus. The Enerfusion Solar Dok patio table is located at The Commons Center patio, and three walk-up Solstice units are located at Branscomb Quad, the McTyeire volleyball courts and the Buttrick patio. 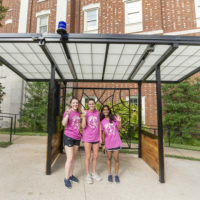 “We wanted to bring the Solar Dok and charging stations to the Vanderbilt campus because, for most people, this is their first direct contact with solar energy. It is a practical application of alternative energy that can benefit students, faculty and staff on a daily basis,” said first-year student Morgan Goldberg, who proposed the project with SPEAR (Students Promoting Environmental Awareness and Responsibility) president Skyler Hutto. 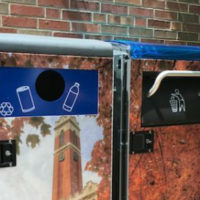 The charging stations were a project of the Vanderbilt Green Fund, a collaborative venture of Plant Operations, the Office of the Dean of Students and Vanderbilt Student Government to fund utility conservation projects proposed by students and selected with student input. 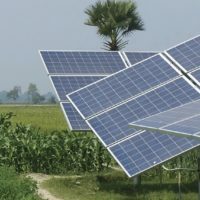 “The Green Fund has provided students a unique chance to advance Vanderbilt’s sustainability initiatives directly and with their own ideas. I hope that this new campus infrastructure will keep people conscious of the university’s ongoing effort to advance itself sustainably,” Hutto said. For more information about Vanderbilt’s sustainability efforts, visit the SustainVU website.